When those unexpected Weather Days occur and you can’t make it to site, there are two things you can do; stay in your room and catch up on the latest viral videos, or get out and do some exploring. In this blog post, we’ve rounded up a few ideas for things to do and places to visit close to some of the UK’s renewables and offshore wind farms. 2017 is a big year for Hull as it celebrates being the UK City of Culture. You can discover a whole range of live music, exhibitions, performances and events. Take a look at the programme on the Hull 2017 website. On the outskirts of the city centre is Hull Marina, an area that is going through exciting regeneration. Here, you’ll find an abundance of new, stylish restaurants, bars and art galleries – a real up-and-coming area. Whether you’re on your own, with friends or with your family, take the opportunity to visit The Deep, one of the UK’s biggest aquariums. Your kids can learn about all different kinds of sea creatures, including sharks, jelly fish and turtles. And, they can even meet the VIPs – very important penguins! History buffs will enjoy exploring this fascinating English Heritage site. Furness Abbey is said to have been one of the richest monasteries in the country, and just a few years ago, a small collection of treasures were discovered here. Find out more. Instead of taking a boat trip to your offshore site, take a short ferry trip to Piel Island, a tiny island off the coast of Cumbria. It’s home to the historic Piel Castle (yes, more history), a pub and beautiful views. This shingle island reserve is an ideal place to unwind and to enjoy simply being in the outdoors. Firstly, South Walney Nature Reserve is home to a grey seal colony, and it’s also a popular spot for birdwatchers, with incredible coastal views. Clacton-on-Sea is famous for its traditional Great British seaside amenities. 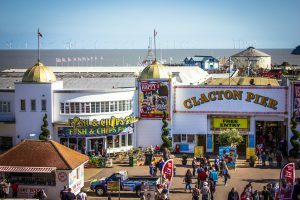 Along Clacton Pier, you will find all kinds of entertainment, from rides and arcades to bowling and SeaQuarium, and can even take up a spot of sea fishing, too. In the heart of the resort, just a short distance away from the seaside, are the Princes Theatre, located within Clacton Town Hall, and West Cliff Theatre & Arts Centre, a traditional 600-seat seaside theatre. They both host a variety of live entertainment throughout the year. Find out more. In the evening, you can venture out to Clacton’s restaurants and bars for some good food and a drink (or two). Or, you can make an hour’s journey to enjoy the nightlife of the city of Chelmsford – the capital of Essex. If you’re lucky, your Weather Day may just fall on a Race Day at Redcar Racecourse. They host 18 days of horse racing from April to November, including Ladies Days and Family Days. If you’re very lucky, you may even win on a bet! The Redcar Beacon has been dubbed the ‘vertical pier’, as this 80ft tower gives its visitors 360° views of the Redcar coastline. And, it’s absolutely free. Middlesborough city centre is home to galleries, restaurants, bars, parks and open spaces, shopping areas and a variety of attractions – and it’s just a quick 20 minute journey away from Redcar. Mostyn is a quaint little village in North Wales, just an hour away from Llandudno and the longest passenger cable car in Britain. From the sky, you can take in the breathtaking views of Llandudno Bay, Conwy Estuary and Happy Valley. A short journey away from Mostyn is the historic St Winefride’s Well in Holywell, a beautiful site that people have been travelling to for over 1300 years. In addition to the Well, you’ll find a museum and shop. Find out more. The more adventurous may fancy a slightly longer journey to Snowdonia National Park. Here, there are hundreds of lakes to discover, trails to hike and peaks to climb, as well as the Snowdon Mountain Railway which takes you right to the summit of Mount Snowdon. The Rapid Accommodation there are always here to help, whether it’s for finding accommodation to your specifications or recommending places to visit – it’s a part of our personal customer service! Give us a call on 0330 090 41 42 to see how we can help you. *Image of Clacton Pier by Angel Escartin Casas is licensed under CC BY-SA 2.0.